Ruairi Harkin is staying at Coleraine Times Sport can reveal. The in-demand midfielder had been atttracting interest from Cliftonville and Derry City, but he has penned a new two-and-a-half year deal at The Showgrounds. 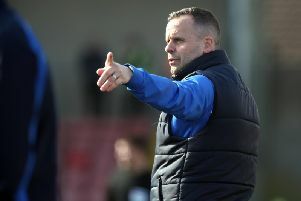 Boss Oran Kearney said he was ‘over the moon’ at keeping Harkin at the club. “I am absolutely over the moon that Ruairi has committed his future to us,” said Kearney on Friday evening. “I know there was a lot of speculation about what was going to happen, Ruairi had said all along that he wouldn’t make any decision until he had spoken to us and to be afir to him he has been true to his word.